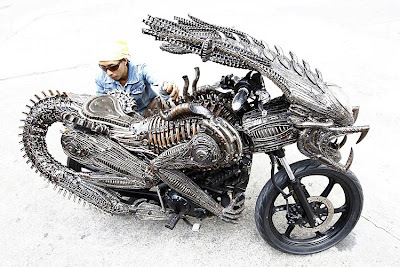 I'm pretty sure that there is only one Aliens-inspired piece of art kewler than that Aliens coffee table I blogged about way back when I first started this blog, and that would be this motorcycle. While not entirely representative of the evil one in the Aliens movies, it definitely does an incredible job of communicating her fluid motion and fierceness. Especially in the head design. In fact, let's talk about the head for a moment shall we? All I can picture is some idiot paying the bajillion dollars for this thing and insisting on taking it for a joyride. One bump later and I don't see that ride ending well. However, I must admit that the implied danger just makes it that. more. awesome. What do you think? Creepy? Kewl? Both?